Not much progress to report on these grey socks. Sometimes I wish I would just knit one sock at a time. Things would seem to go faster. There's an advantage to making socks from the toe up. You get to try them on as you go. There's quite a bit of stretch to these and they are fitting me nicely. My hubby's foot is slightly bigger so I may have to make him a different pair. Oh darn! Today I'm headed to a friend's house for some crafting and visiting. Just a little group of us will sit and chat while working on our projects. 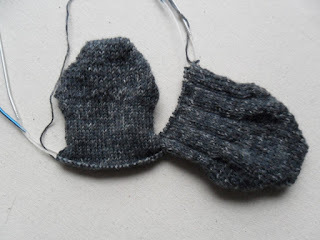 I'm hoping that I might get the foot completed so that I can start on the heel shaping. Thanks for stopping by. Be sure to visit Patchwork Times for links to other "On the Needles" projects. I started a new baby quilt yesterday. I had purchased the fabrics a few months ago and was going to teach a friend at the lake how to make the Trip Around the World pattern but we never got to it. At the time, I didn't have the pattern booklet I used in the past so I got on the computer and used my Cad software to generate a layout and some instructions. Now I'm testing my instructions and I must say that my version is really simple and easy. 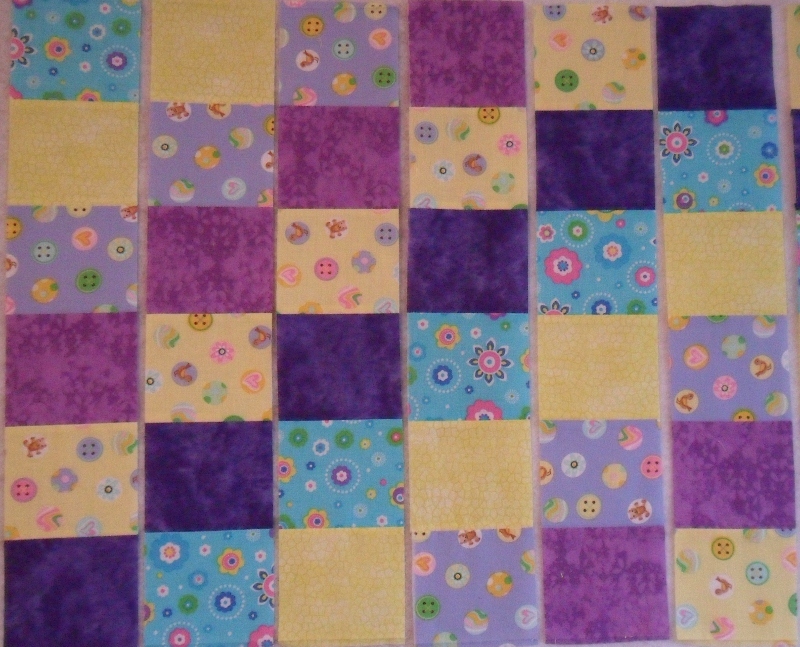 I'm using six different fat quarters and will add a border to make the quilt around 41 inches square. The finished squares will be 3" so I cut the strips at 3-1/2" wide. This method involves sewing the strips into sets and then into tubes. The tubes are then sub-cut 3-1/2" wide. Then, following the layout sheet, you remove the stitching between two of the strips in each tube. Thanks for stopping by. Be sure to visit Patchwork Times for links to other design walls. I did a little more yarn shopping this past week and came home with this beautiful virgin wool by Lana Grossa. The label says its 80% virgin wool and 20% polyamide made in Italy. I love the little light gray flecks. This will make a nice pair of socks for hubby, although it will be hard to not keep them for myself. As usual, I'm knitting them two at a time, from the toe up. My friend and I had a discussion about this and even though I agree that making one sock at a time seems to go faster, I still prefer to have a pair of socks ready to wear as soon as I bind off at the cuff and weave in the yarn tails. This is a simple short-row toe and heel sock with a k5, p2 ribbing on the instep that will continue up the leg. I wanted to do a little design but keep it simple enough that I can still watch t.v. while knitting. Some of the patterns I would like to try would require more concentration than I'm willing to give right now. This way I can feel productive while viewing some of my favorite shows and movies. In case you were wondering, I set aside the skyp socks until after the holidays. Those will be for me and with Christmas coming soon I still have a few gifts I want to make. Thanks for stopping by. Be sure to visit Judy's blog, Patchwork Times, and check out the links to the projects others are doing. Yesterday I went to a DIY yarn store here in Portland, Oregon. At Yarnia I selected one strand of bamboo and three strands of Moreno wool and created my own sock yarn. I tried to go subtle with my color selections and now I kinda wish I had chosen a little more contrast. The gall at the store took my selections and then loaded them on a machine that combines the fibers and spins them onto a cone. This was a new experience for me. When I got home, I started making a swatch for the Skyp socks. I really like the feel of this yarn and the pattern is pretty easy, too. 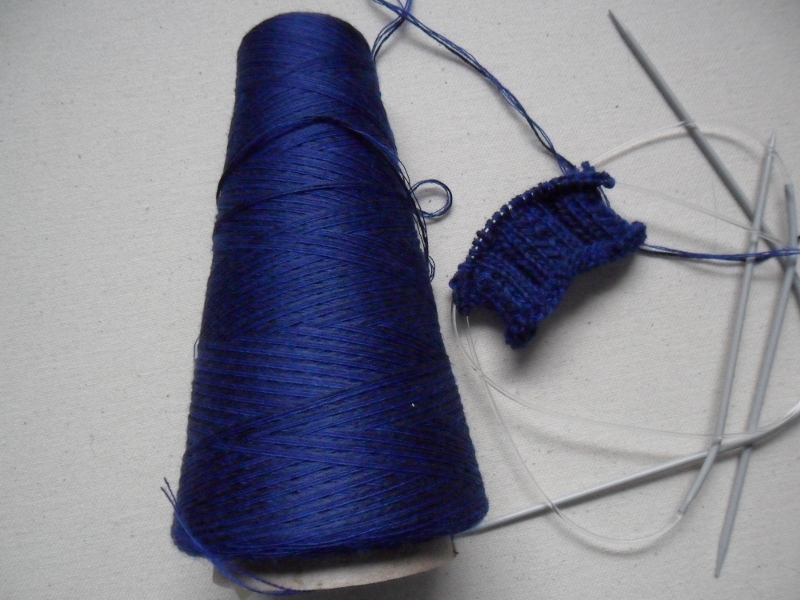 I do have to be careful not to split the fibers since they are not twisted like other yarns I've used. I'm looking forward to starting these socks for real. Be sure to visit Patchwork Times and see what others have on their needles this week. Lots of socks being made out there in blog-land. Done! Yeah. 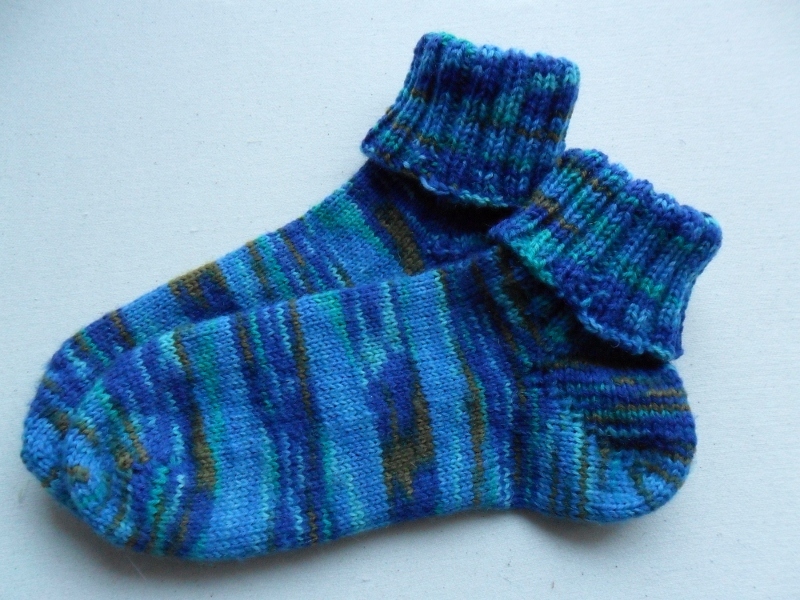 Actually, I finished these blue striped socks last week but forgot to make a blog entry. 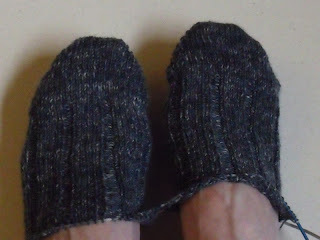 I have yarn to make another couple pair of socks and wool for felted slippers. I just haven't decided which project to start next. I've been reading a lot about the skype socks and got the pattern off Ravelry. 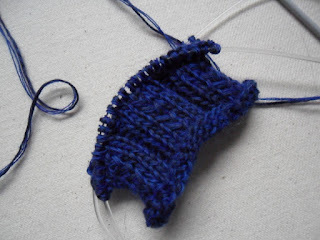 It looks easy and the pattern would be a step up from the plain stockinette I've been doing. At this point I'm favoring the short-row toe and heel shaping. Thanks for stopping by. Your comments are always welcome. Be sure to visit Patchwork Times for links to other On The Needles postings.